'Earth's crammed with heaven And every common bush afire with God.' These words of Elizabeth Browning are illustrated in the stories contained in this collection of country parables by the author of 'In the Shadow of Aran' and 'In the Shelter of the Fold', also published by Bryntirion Press. It explores a world of rowan trees, dragonflies, swallows, carrion crows and the beautiful red kite, and draws out spiritual truths from the common scenes and happenings of a Welsh hill farm, in a natural yet absorbing manner. 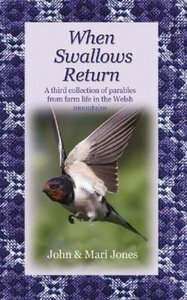 'When Swallows Return' would not have appeared without the help which Mari Jones received from her husband John, and it is her long-held wish that this new edition be published under joint-authorship. - Publisher Casgliad o ddamhegion o fyd fferm fynyddig yn Llanymawddwy sy'n arwain y darllenydd yn gynnil a gafaelgar at y Crëwr sydd y tu ôl i'r cyfan. Argraffiad newydd; cyhoeddwyd gyntaf yn 1992 (ISBN 9781850491071). Casgliad o ddamhegion o fyd fferm fynyddig yn Llanymawddwy sy'n arwain y darllenydd yn gynnil a gafaelgar at y Crëwr sydd y tu ôl i'r cyfan. Argraffiad newydd; cyhoeddwyd gyntaf yn 1992 (ISBN 9781850491071). John Jones is a Management Consultant working with a wide range of public and private sector clients. When Mari Jones's first collection of stories, In the shadow of Aran, was published in 1972, Dr. Martyn Lloyd-Jones wrote a foreword introducing the author. However, an introduction to this her second collection was hardly necessary when it was first published in 1979, since by then Mari, her husband John and Brynuchaf, their farm in Llanymawddwy in North Wales had won their way into the hearts of thousands of readers both in Wales itself and far, far beyond.